Yesterday afternoon, President Trump announced two executive actions regarding immigration, including construction of a wall along the U.S.-Mexico border and several aggressive strategies to enforce our nation’s outmoded immigration laws. The orders are unworkable, irrational, and wrong. These policies have one basic goal – fostering divisions harmful divisions among cities, among co-workers, among parishioners and neighbors. But the people of Greater Cincinnati will not be divided. Here in this town President Trump’s efforts will fail. In our beloved community we remain devoted to unity – committed to basic human decency for all. To celebrate this unity we have formed the Coalition for Immigrant Dignity, an alliance of labor, civil rights, faith, and charitable groups. Coalition members are employers and employees. We are clergy and parishioners, clients and social workers, students and teachers, vendors and clients, patients and care givers, parents and children, sons and daughters. We are first generation, we are 12th generation, we are new arrivals – refugees, visa holders, and others patiently waiting for an opportunity to enter on the pathway to citizenship. We are citizens and immigrants together. We believe in one another. 30 years have now gone by since Washington D.C. leaders came together to craft comprehensive updates to the nation’s immigration laws. A generation’s worth of D.C. leaders have failed to deliver needed changes. With these executive orders, the nation’s collective failure is now occupying center stage. All who oppose these orders are encouraged to join our local Coalition for Immigrant Dignity. Our coalition brings thousands of men and women together, makes them members one of another. We will share with one another common tools for common goals. We will educate, advocate and organize to oppose unjust deportations, defend the DACA program, and prevent harassment and bullying in all forms. Our goals are goals for all America – and our enemies are the enemies of all progress. The two cannot be separated. Cheryl Young is the assistant provost for global education at Miami University. 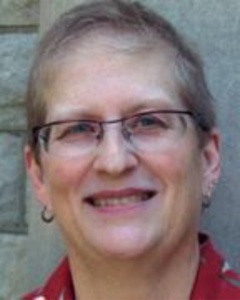 She is a long time staff member at Miami University, with over 30 years of experience in higher education. Cheryl leads the Global Initiatives center at Miami, which includes Study Abroad, International Student & Scholars Services, Continuing Education, the Confucius Institute, and the Center for American & World Culture. As an international education professional, as well as an experienced administrator in continuing higher education, Cheryl brings multiple perspectives to international education and enthusiastically embraces the ideals of extended and lifelong learning in formal, informal, and virtual settings in local and global locations. Cheryl has an academic background in English Literature and Educational Curriculum and Leadership, with degrees from Miami University and the Wellesley Institute for Leadership & Management in Higher Education. Cheryl in a resident of Oxford, Ohio, and enjoys traveling the world in pursuit of learning opportunities, connections to cultural diversity, and promoting Miami University global initiatives. Cheryl joined the Greater Cincinnati Chinese Chamber of Commerce’s Board of Directors in July 2016. 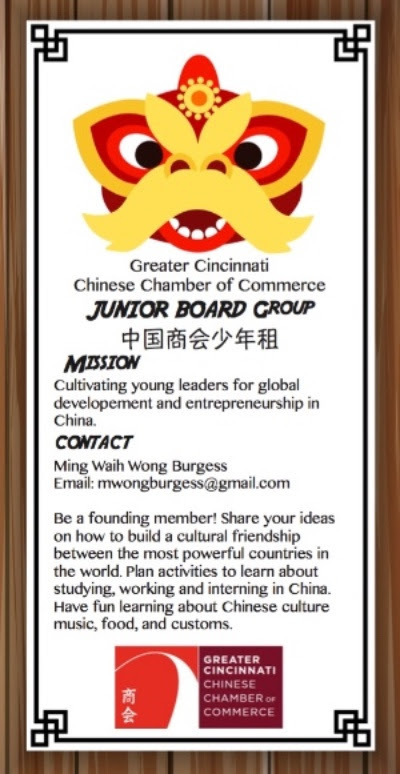 Recruiting Founding Members for the Chinese Chamber Junior Board, a new opportunity for local high school students! EB5 of Ohio is a local EB-5 Regional Center in Cincinnati, OH. The EB-5 Immigrant Investor Program is a federally-sponsored investment program coordinated by the United States Citizenship and Immigration Services (USCIS). The goal of the program is to facilitate the flow of foreign investment in the U.S. economy and promote the creation of U.S. jobs. The EB-5 program provides foreign nationals with the opportunity to become conditional residents upon making an investment of $1 million, or $500,000 if in a designated Targeted Employment Area (TEA). The investment must be in new commercial enterprise and the investment must create, directly or indirectly, ten (10) new jobs for U.S. workers. Once this requirement is met, the investor may obtain permanent residency. EB5 of Ohio was founded by Nigerian American Chinedum Ndukwe. The son of two Nigerian immigrants, Chinedum played for the Cincinnati Bengals for 4 years, and upon retirement, launched Kingsley and Co., a real estate investment and development firm. Chinedum was attracted to the EB5 program because it creates local jobs, stimulates the local economy, is a helpful tool for immigration, and is a great resource for developers as it offers low interest financing.